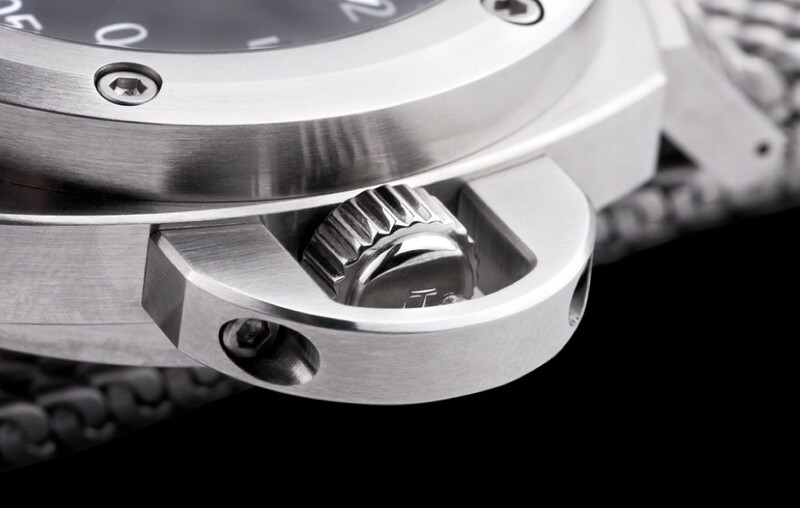 THE Adventure GMT: The GMT version of our Adventure Automatic. 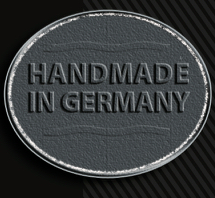 Our German made watch features a diameter of 45mm (bezel). 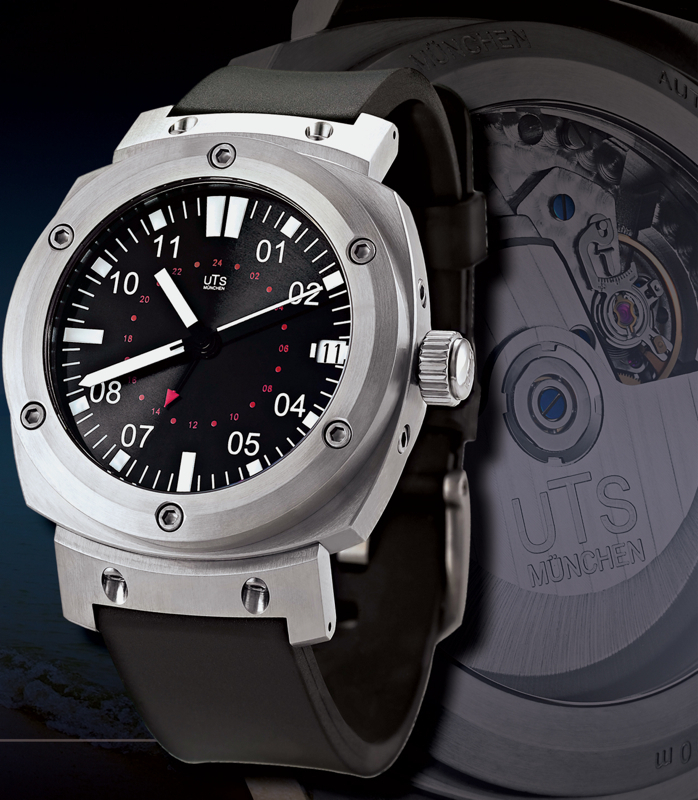 The Adventure Automatic is one of the stars of the UTS range. In short, it is designed and manufactured by a genuine engineer, and you’ll feel it every day. Features a deep black dial with Sunray pattern. 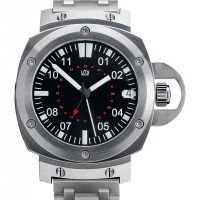 Red GMT scale and a red GMT hand. 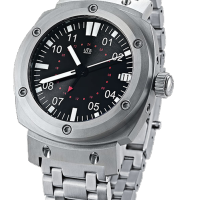 The new Adventure GMT uses a Valgranges Swiss movement with GMT complication. 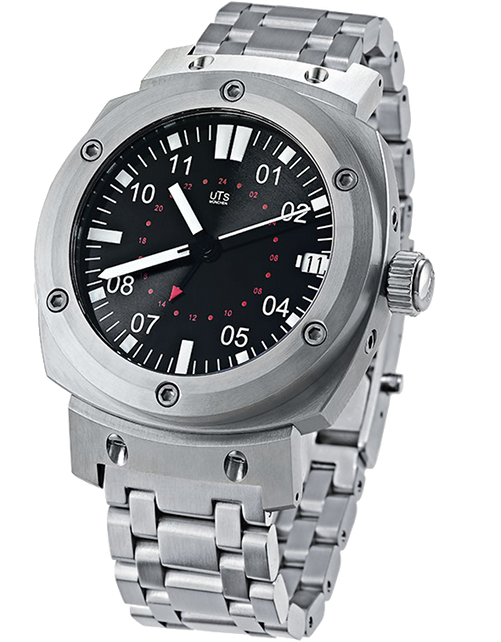 this German masterpiece is 45mm in diameter with 500m water resistance. Using the best quality surgical stainless steel grade 1.4404. 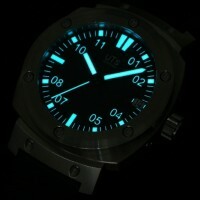 The dial sports super bright Super-Luminova glowing in bright blue. 6 hex screws connect through front-middle into the back watch case. 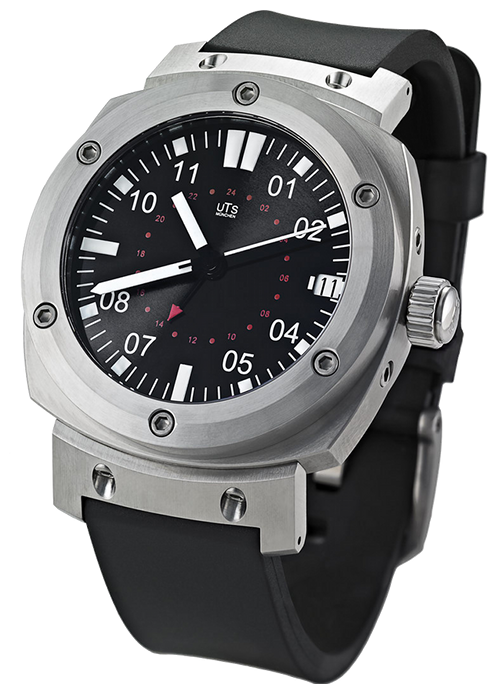 Each case is CNC machined from solid German Steel The Adventure rating is typical conservative rating of an engineer. Each watch is tested well beyond the printed specifications. All of our watches feature our in-house case construction. 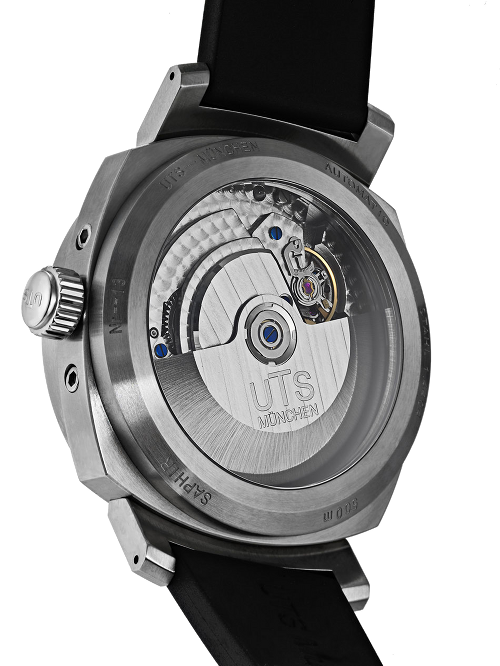 Thick sapphire crystals front and back with A/R coating on underside to insure scratch-proof viewing of the highly legible dial with signature super Luminova glowing in bright blue during dark diving conditions. 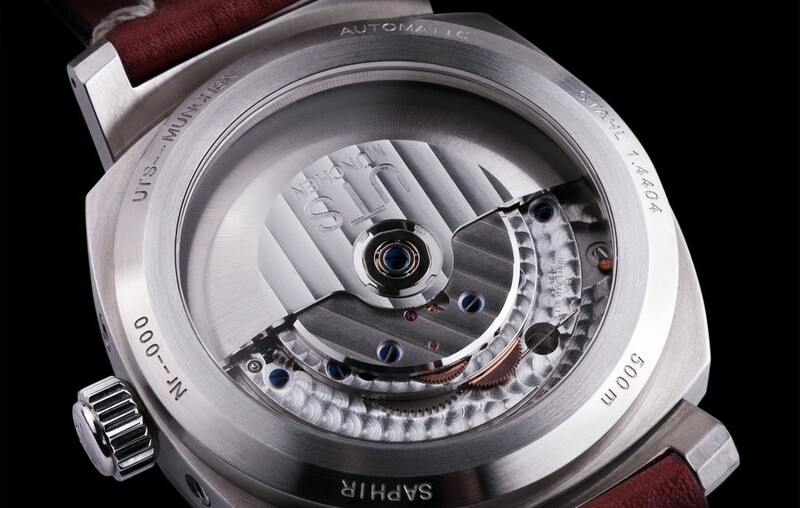 Featuring a Swiss Automatic movement; the Valgranges GMT further adjusted to 5 positions by Nicolaus Spinner who also makes the watch case himself in Munich, Germany. The Adventure GMT comes with our rubber divers strap, leather strap and an optional solid link bracelet . 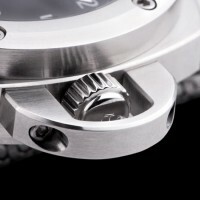 The UTS Adventure GMT watch can also be fitted with a special Crown Guard to complete the package. The Adventure GMT was my first UTS watch, and it is a wonderful value. The distinctive look and comfortable rubber strap led me to next go for the 3000M. All in all, I highly recommend the whole UTS experience. Good products and good people. I received my Adventure GMT with the stainless bracelet less than 24 hours after ordering it. I must admit I was nervous about ordering a watch I had only seen online. Stephen spent a good amount of time with me on the phone and answered all of my questions. When I opened the box and saw the watch, I knew I made the right choice. 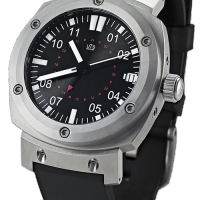 It is a big watch, very heavy and very solid and was better than I expected. I am very happy with my entire experience with UTS and would not hesitate to recommend them. The Chronograph will be my next watch. I was worried at first the watch size was going to be too big. As soon as I put it on I knew it was perfect. I don't have a large wrist just about 7" and this watch fits perfect. 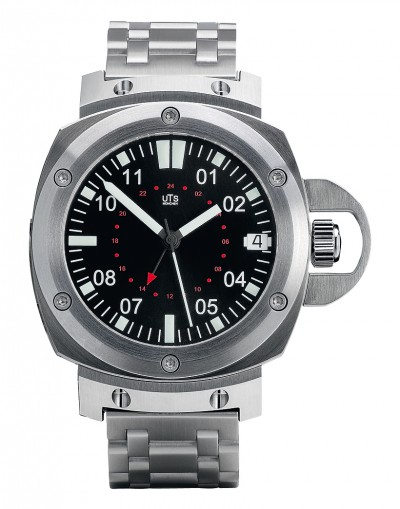 The dial with the red GMT scale is very handsome. This is a high end watch that is worth every penny. 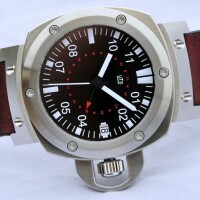 I'm already looking to add the handwound Adventure to my collection I just love this watch! This watch oozes quality I have never seen a case made this way. And for good reason not only did Herr. Spinner make the case he designed it. 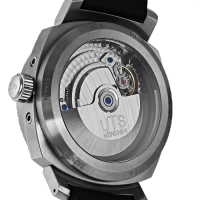 There are not too many watches on the market with the Valgrange movement especially the A07.171 as featured in this watch with all of the TOP grade finishing. 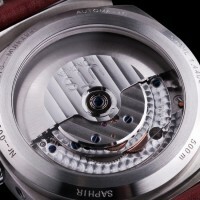 The sapphire display back shows off this fantastic movement. 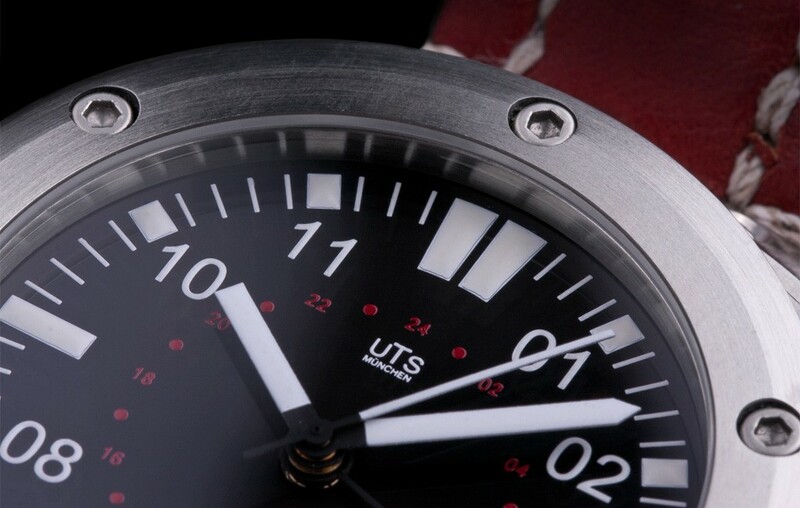 The dial on the UTS is just stunning to look at. 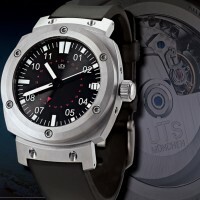 I love my UTS Adventure GMT it is my favorite watch and will never leave my collection. one. The design is crisp and clean. The dial is incredibly easy to read. 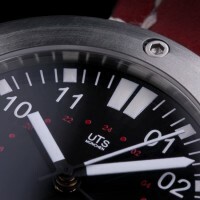 The bracelet, as always with UTS, allows the watch to sit easily and comfortably on my wrist. 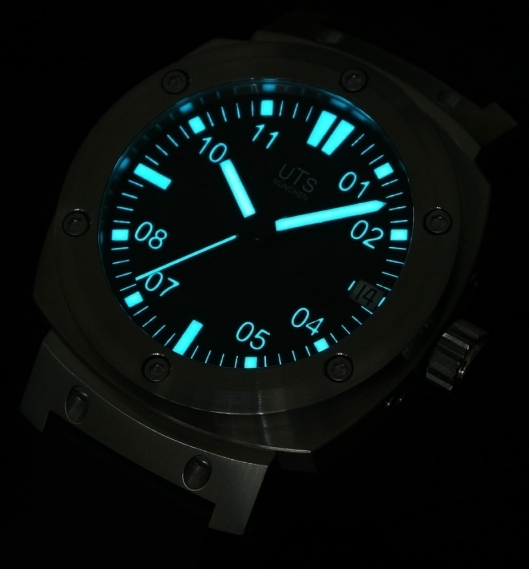 And, of course, the lume is superb. Once again UTS has taken a great watch and made it just a little better. The GMT feature is a nice touch to the Adventure model. Big, tough, well built, I could go on and on. Well done UTS!